OUR HOUNDS by Debby Parry. I thought I would write to you after reading Brian’s story about how he obtained his hounds. My husband Alan and I were just married and living in a flat when we first decided that a basset hound was our dog of choice. The 1st floor flat was due to be sold and a more appropriate basset home was in the pipeline, however after loosing our buyer for the third time we had to cancel our ordered basset puppy as we didn't know how long it would take to find another buyer. Eventually we moved into our new house and my husband announced that he was off to work in Russia for 6 weeks. “OK”, says I, “But if I am going to be on my own I think it's time for a puppy”! How and why we ended up with a Cavalier King Charles I’m still not sure but he was a marvellous first dog and probably a better breed to have first as we found out later!! Joe was a lovely boy without malice and totally wonderful with our two children who subsequently came along. He died 13 years later after a brave battle with a heart murmur, splenic tumour, cataracts, deafness and a painful spine condition. During Joe’s last few months with us, my mother asked if we would consider taking on a relative's basset hound which the owners could no longer care for. Why not, we thought and went to meet the dog. When Chester was released from his utility room prison, it was like meeting a tornado for the first time. He wasn’t quite what we had imagined our basset to be. Apparently his owners had been sold him as an eight month old puppy from the back of a van at a motorway service station and had no idea what they were buying. 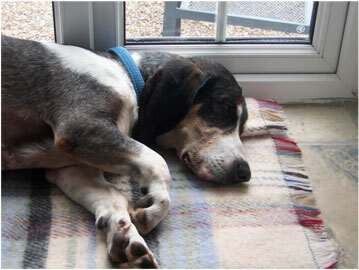 After much research, we think he is an English Basset or maybe a basset crossed with a beagle? He had no muscles and toenails like a velociraptor, his owners had four children in very quick succession and had no time to walk him. Also due to the fact that the children were scared by his boisterous disposition, he had been kept in the utility room for the past two and a half years and not allowed to socialise with the family. How could we leave him there? (A question I have asked myself repeatedly over the last few years)! We collected Chester’s worldly goods together and put them into the back of my car. By the time we had made our way to our seats, Chester had jumped over the back and was happily making himself comfy next to Eleanor, my youngest daughter. Eleanor and Chester were to become great friends and to this day, she is the only person that Chester has any respect for. Life with Chester is not easy, he is loud, he has attitude, he has no manners, he can be very grumpy, he hates all other dogs except basset hounds and cannot be let off the lead. He steals regularly and is scared of any medical procedure, especially ear cleaning (due to an untreated ear infection which we had to deal with when we first got him) and toe nail clipping which he had never experienced before the age of three. However, there have been many times when he has left us bent double with laughter at his crazy antics, he can be incredibly nice when he wants to be and Eleanor has managed to teach him numerous tricks including ‘bang’ which involves being shot with an imaginary gun and he then theatrically dies and rolls over onto his back like an Oscar winning actor! He likes to be put to bed at night under his 101 Dalmatians duvet, which needs to be held up for him so that he can get comfy before being tucked in and loves wearing clothes of which he has quite a collection now. 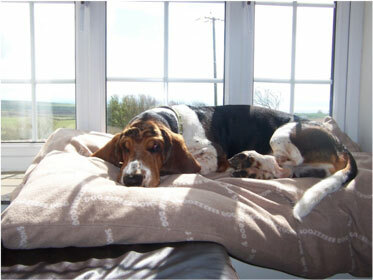 Having Chester didn’t quite fulfil our desire for a Basset hound and so in August 2004, Ralph came to us from the Brakenacre kennel in Plymouth. To say that he has been a handful is putting it mildly, but a joyful handful at that. I have lost count of the shoes, mobile phones, television controllers, children’s toys, biros etc. etc. that he has destroyed and the amount of accidents that he has had (mainly on my beautiful Chinese rug), but one look from that handsome face, we melt and all is forgiven. I had thought that I would show him, but Ralph had other ideas and played up so badly in the ring that it wasn’t long before we decided to end his showing career! He adores Chester (not reciprocated) and has diagnosed many of Chester’s medical problems by intently licking the affected area until we take Chester to the vet who confirms that indeed there is another problem to be dealt with. He is now known as Dr Ralph! Ralph was recently used as a stud dog and fathered 14 puppies, sadly they didn’t all make it and only 6 survived, but it is nice to think that there are little Ralph’s out there. I don’t know if we will have any more Bassets, I would love to have either a Bloodhound or a Coonhound in the future, maybe when the girls have left home and I have more time, but the Bassets will always be in my heart. ( Ed. Debbie, many thanks for this interesting account).